Wedding of Talon and Jordon Baker at Kingwood Center in Mansfield, Ohio. I had the unique pleasure of photographing the wedding of Jordon and Talon Baker this last December at the gorgeous Kingwood Center in Mansfield, Ohio. What a beautiful couple and gorgeous location! Benjamin Lehman is a commercial photographer in the Canton, Northeast Ohio, area. This past May Benjamin Lehman Photography was given the opportunity to shoot a gorgeous wedding in historic Morristown, NJ. A little history about Morristown, and I’ll keep this brief; Morristown stood as the headquarters a for General George Washington’s and the Continental Army after victories in Trenton and Princeton. Much of the scenery reflects the areas colonial heritage — this leads to many great photographic opportunities if you know exactly how to work the history into photos. The morning of the wedding started with me, my cameras and the wedding party getting ready at the Morristown Hyatt. The Hyatt is swathed in beautiful decor and style, making it very easy to take great photos. When I work alone, (as I did for much of this wedding), I make sure to know the schedule for the day down to a T. I often go as far as to measure the time it will take me to get between points A and B the day before so I can factor driving and walking times into my own schedule. I started the day with the bride and the bridesmaids getting ready in the bridal suite. In many ways, these are my favorite photos to take during the day of the wedding. The girls are always full of smiles, the atmosphere is filled with excitement and the over all transformation of becoming a bride is a magical thing. Once I’ve taken a few shots of the ladies, I’ll head over to where the gents are getting prepared. Guys are also fun to photograph, but for different reasons. The atmosphere with groom and groomsman is almost always laid back. It usually constitutes of one or more guys asking another how to properly tie a tie, discussing sports, and dirty jokes. Shooting with the guys usually goes fairly fast, maybe 15 to 30 minutes. Then I head back to the girl’s room to capture some more pictures as they finish getting ready. Some weddings schedule time for Bridal Party photos after the wedding ceremony, and some do it before. For our gig in New Jersey we had 2 hours before the ceremony to get all the photos we needed. Because I had scouted many locations the day before I had a great mental plan of attack. I would take most of my pictures in a garden behind a historical house, and save one last photo for a specific place in the museum where the ceremony would take place. At the last moment I did have a change of heart with taking all of the photos in the gardens — I realized I didn’t want a large bulk of the photos to have a similar background. Additionally, I’d like the groom and groomsman to have a slightly more manly environment. So, I took the guys and we went to the hotel bar. It just so happens that the Hyatt in Morristown has one of the best looking contemporary bars I’ve ever seen. At one point I even had them order shots of whiskey so I could grab some great photos of a toast to the groom. Once I finished with the guys in the bar, I headed with the ladies to the garden. This all happened in early May, which meant all the trees were flowering, the grass was green, and the entire area was alive. When I pose for bridal party photos I’ll do two things. First, I’ll do the traditional stand-next-to-each-other photos. They aren’t my favorite photos, but they serve a traditional purpose. Then, once those are out of the way I’ll start to pose my subjects like we’re shooting photos for a magazine spread. I do this by putting people throughout the environment, and adding depth and interaction between the subjects and their surroundings. You don’t have to make it too elaborate however. For this shoot, I found just a little depth in my photos between the various bridesmaids is all we needed to create some wonderful photos. After our time in the gardens the entire wedding party packed up and headed to the wedding venue at the Morris Museum. The museum itself is an amazing venue. It’s part old mansion, part contemporary museum with displays for both kids and adults. The ground’s curator, a great guy named Peter, gave me a personal tour. Perhaps the thing that impressed me most is the fact that there are priceless pieces of art on display without barriers to the public. If one so wished, he could walk right up to a Rembrandt and touch the very paint laid down by the master so many years ago (but,uh, don’t do that). The atmosphere of the mansion and all of it’s beautiful paints had influenced me earlier when I was scouting and it gave me an idea for a photo. Once myself, and everyone else arrived, I ushered them into one particularly gorgeous room within the mansion. My plan was to take a wide-angle photo with the entire wedding party. I wanted it to be very stylish, very dramatic, with strong shadows and highlights. The only problem was I had to photograph a huge room and only had one studio strobe available. My solution was to use a technique where you take multiple photos, moving the light between each photo, and then merge the photos together in Photoshop to create one, complete photo that has a big-production look to it. We only had 5 minutes before the ceremony began, so I moved very quickly, posing people, taking the photo, moving the light, and taking the next photo over and over again until I knew I had all the elements I needed to create the picture I set out to capture. Once that was finished I took my place in the back of the hall, down the center of the isle as the ceremony started. Once the ceremony starts, it then becomes a job of capturing the beauty of the wedding as it unfolds. The evening ended with a marvelous reception. My plan of action was to be the fly on the wall who flits around and snaps all of the brilliant candid moments that happen around the room and on the dance floor. My time in Morristown, NJ stands as one of the most superb weddings I’ve ever had the pleasure of photographing and it left me a great feeling and urge to have more experiences like this one. Benjamin Lehman is a commercial wedding, portrait and advertising photographer willing to travel to where ever the beautiful pictures are! Photos of you and your wedding party getting ready are some of the most important photos you’ll want to have as memories of your wedding day. You’re going to be drop-dead gorgeous on your wedding day — your photos should be too! Hanging out and taking pictures of the groom and his groomsman is always a blast. Wedding photos should be timeless and look as if they belong in a magazine spread. To create a big-production look for this photo, I took several photos while re-positioning the light between each picture. 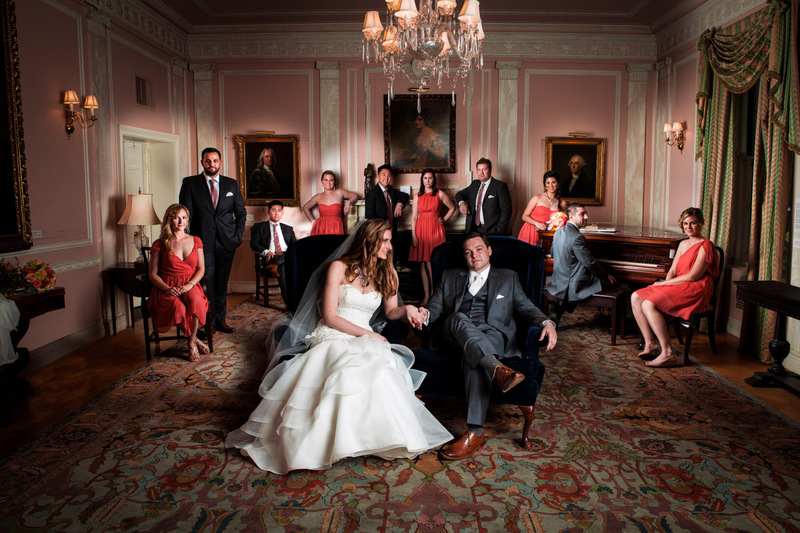 Once assembled in Photoshop, the final effect is a beautiful, cinematic portrait of the entire wedding party. Here in Canton, we have have a great park known as Water Works Park. The park is actually a chain of parks including Stadium Park, McKinley Memorial Park and City Field Park in addition to the aforementioned Water Works Park. Through this park chain there are a multitude of locations for photography. Some areas are great for fitness photography, some are great for high school senior photos and some are perfect for bridal and engagement photo shoots. The landscape of the park changes dramatically along it’s length so you should never be left wanting for a change of scenery. Along side the park runs the Nimishillen Creek, which is actually classified as a river. This sheet of running water can also serve as a backdrop for photos shot near its banks. One of my favorite places to shoot is in an area known as the Garden Center & Children’s Garden. This area is filled with trees and all types of wonderful flowering flora, changing dramatically depending on which season you visit. A small creek runs through the gardens off to the side through a series of stone walled water falls. This is another great area to shoot along. This side of the garden also offers a lot of shade to help photographers who have a shoot scheduled in the mid-day sun. Brides can be photographed in both the Garden Center and the Children’s Garden easily from almost any angle, although you do have to be careful in some areas since the background can be cluttered with structures. With some careful planning you should be able to work around this easily. Place your subject on a hill and shoot up at them to convey confidence and strength. For Business or High-School Senior portraits there is a wonderful trail that winds alongside another smaller creek on the western edge of the park. One of my favorite places here is a small waterfall with steps where you can take both standing and sitting portraits against an interesting backdrop of either water or trees. If you get there at just the right time (around 7:30-8:30 pm in the spring/summer) you can actually catch the suns light peeking through the arches of the waterfall’s bridge. The McKinley Monument, only 100 yards or so west of this point, also serves as a strong backdrop for those moments when your photo may need to convey strength or longevity. Try placing your subject’s back to the monument and shoot down the wall towards them with a shallow depth of field. Because the park winds around with the river you should be able to move to a new location to effectively change the sun’s impact on your subject. Evenings after 5pm are best since the morning day sun rises over a row of houses instead of the trees that line the western side of the park. Photographers in larger cities often have a ton of go-to locations for photography while those of us in slightly smaller cities really need to dig deep to find of those over looked gems. While Water Works Park is no secret, it’s not used nearly enough, in my opinion, as a backdrop in photos. In an upcoming article I’ll talk about how photogs in smaller cities can scout out promising locations that offer both easy access and unique looks. 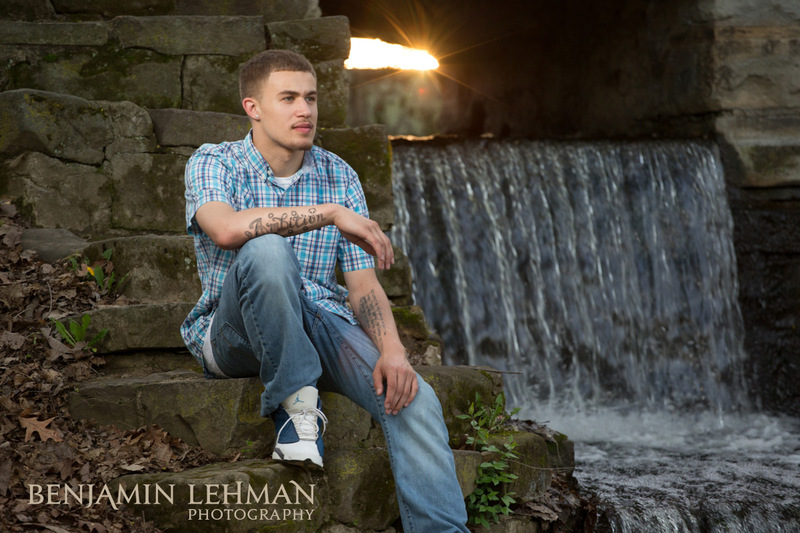 Benjamin Lehman is a Commercial Wedding, High-School Senior Portrait and Advertising Photographer based in Canton, Ohio. Brookside Farms – The perfect place for wedding, engagement and bridal photographs. With it’s rolling hill sides, old fence backdrops, and historic Barn, Brookside Farms is an amazing place for a wedding. Set on 120 acres of lush pastures, Brookside Farms provides no-ends of possibilities for a modern wedding with an old-world touch. Separate houses are provided for both brides and grooms, (the farm house for the Bride and the “The Lodge” for the groom), to allow them to get ready for their big day. And when I say houses, I mean it. These aren’t simple rooms with just enough space for the wedding party to get dressed; these are fully fledged homes with areas to meet and mingle, full sized bed rooms for the bride and her party to prepare. These homes are perfect for pre-ceremony photos – capturing those small, intimate, moments where everything comes together. The ceremony itself can be held in any number of areas on this sprawling farm. Both the fields and the historic barn are two great locations for a wedding filled with ambiance. Trees and wooden fences dot the landscape, giving any outdoor wedding a picturesque backdrop. The barn, a 6,000 square foot historic structure, is perfect for both wedding ceremonies and receptions. It has extra rooms for catering use as well as completely modern restrooms – no guest has to worry about using an outhouse! The farm house, as mentioned above, is a beautiful location for wedding photos and can also serve as housing for out-of-town guests. It’s an 1870’s brick house that has been completely restored with 3 bedrooms, two full baths, an functioning kitchen, a sitting room, sun room, and living & dining rooms. It’s a gorgeous place to take pictures of the bride and her party when she puts on her wedding dress. There’s even wireless internet for those people who want to keep their social media friends who couldn’t attend in the loop. It’s important to mention that there are a lot of people involved with any ceremony. Wedding florists, wedding planners, wedding caterers and of course wedding photographers; Brookside Farms is set up perfectly to handle all of these flawlessly with a dedicated staff ready to help in any way needed. When I was there last, taking photos for a couple who later became good friends, I found the Brookside Farms to be filled with charm and convenience. The perfect confluence of beauty and practicality. There was no where on the property to take a bad photo – the farm did most of the work for me. And when the evening finally came, and the sun began to set behind the hills the photos just kept getting better and better. Brookside Farms isn’t just limited to wedding day photography either. Engagement photos and Bridal Portraits can be taken there as well. 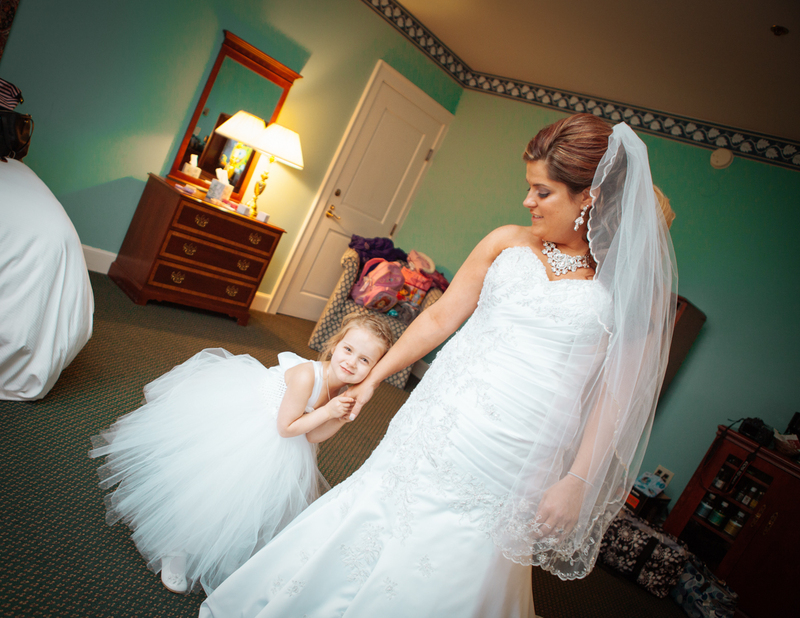 Benjamin Lehman is a Commercial Wedding Photographer from Canton, Ohio.